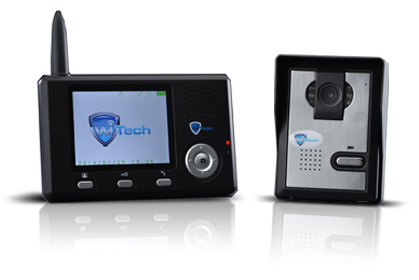 WiTech Video Phone is a simple and easy solution if you are living in an apartment where the security requirements are much lesser. You need to monitor only the front door. It consists of two units a camera phone unit which is to be mounted on front door and portable table top wireless screen which can be placed anywhere in your house or carry around with you within the premises. The setup is simple and the wireless signal is very strong to cover upto 50mtrs and it travels through multiple concrete walls. It enables you to see who is at the door, can see and talk to the person. You can even unlock the door right from your bed. It stores still images using its built-in storage. It is not IP based so you cannot stream it to any other devices.